Culmination of the series that began here. Being the senior projectionist, at the tender age 22, as the midpoint of 1977 approached at the independent Huntington Park Warner Theatre was a one-of-a-kind experience. More so because the movie theater had been a haunt of mine since childhood, as a kid growing up in that part of Los Angeles. I had journeyed from a tech tyro, who knew next to nothing about the trade, to someone who could at the very least get a movie projected for the paying public to watch. Just as well, I learned how to teach the basics of the projection booth to anyone hired off the street. No doubt helped by having to do so too many times over. As I came to the end of my employment there, I began to experience similar feelings toward the job as my brother once did, the former senior projectionist before me. It was eerie to see myself walk the same path, at the same theater, and end up with same result: that of giving notice. As much as I enjoyed watching movies, the grind of projecting them over the last few months of my stint there, while finishing coursework, took a toll on that general outlook. Although, when films turned up in the reel cans that were worth repeated screening, Wednesdays (the old traditional day the movies changed) could be the very best day of the week. Time in the booth would move fairly quickly when this was so, as some of those highlights in the preceding series parts covered. Those intervals, though, seemed to arrive fewer and further in-between in the final months of my tour of duty there. This was especially true after the Christmas season of 1976. That holiday period, seemingly, was the high water point for my post as the senior tech. 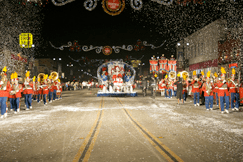 The city of Huntington Park‘s annual tradition of a holiday parade that went down the main thoroughfare, Pacific Boulevard, proved to be that marker. And having access to the projection booth, meant I had access to the roof — which offered the best views of the parade, bar none. The Huntington Park Christmas Lane Parade has had a long history, since 1946, and was a highlight for that suburb and area of Los Angeles back then. And it remains so to this day. In younger days, I attended this event many times. Having worked the day of the parade, I stayed after my shift to watch it from the roof’s vantage point. My brother and his friends also came by that evening and joined in on the viewing. Since the only parking available for this event was behind the commercial buildings each side of the boulevard, they parked behind the theater. As he had done with friends, they walked up the exterior exit stairway that garnered them free screenings and entered via the balcony egress, where I let them in. One of the age-old traditions, I think — and one that could get you fired by this movie theater owner. As we were all young, it seemed worth the risk though. Completing the Bicentennial, crossing into 1977, only diminishing returns were left on my plate at the venue. 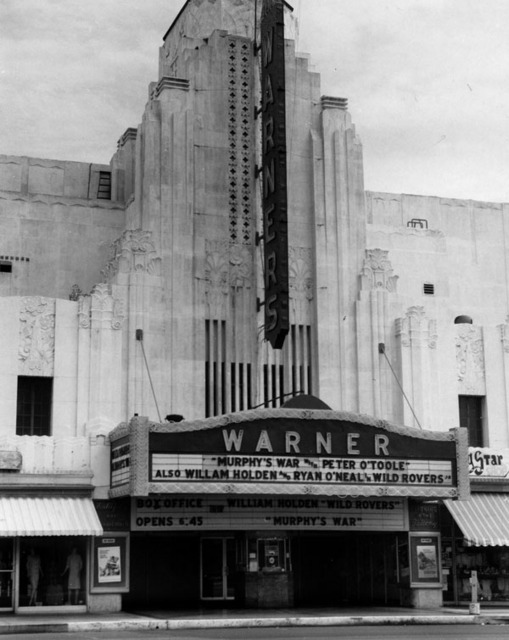 The chronic low wages paid at this independent movie theater directly led to the ever continuing turnover for all personnel. Be it concession stand or projection booth, but especially for the latter. It appeared that I was always training someone new each month. Likely, it wasn’t that bad, just seemed that way. And truth be told, some of them had no business being hired, let alone entrusted to run the venerable arc light projection equipment in that grand old booth. When those not qualified left, and it was only a matter of time, it was one of the few instances I was happy to see new replacements come in. Still, many more performed the job wonderfully in their brief stretches, and with skill that belied their layperson status. Honestly, we were all strictly amateurs working a venerated, esteemed craft, care of one businessman’s approach to profitability. We were temporarily let in to this august group, and I daresay it left a mark on each of us. Ultimately, I had no say on who joined in this exclusive club. That was the purview of the proprietor, or fate. Add to this, college once again had picked up in tempo for that spring semester. The number of hours I could dedicate to work had begun to place a strain on my courses. As much as I loved the cinema, and the special skill it took to be on this side of it, I inwardly knew this wasn’t going to be a career for me. Not here, or under these circumstances. All of which added to my dissatisfaction. The net effect I weighed. So before my finals were about to arrive, I gave my notice to the theater’s owner. It was an amicable parting, though. No fits or words worthy of his legendary temper or cursing were exchanged. Surprisingly, he said he was amazed that I stayed as long as I had. Almost the same length of time as my brother — who departed in ’76. No doubt, he was well aware of the effects his pay schedule had on personnel. Still, the bottom-line was the bottom-line for the theater owner in how he ran his venture. So, by the end of June in the year 1977 I walked out of the Huntington Park Warner Theatre for the very last time. I can’t for the life of me remember what was the double-feature playing that week, which told me the pair were not very notable. As I stated, the last worthy film I recall screening was J. Lee Thompson‘s The White Buffalo in May of that year. Everything after simply a blur. I drove by the theater a few times that summer, as I still lived in nearby South Gate. Looked to see what was on the marquee, but never entertaining a notion to stop by. I guess I thought I had closed a chapter and had started another. Still, I gave thought to the memories I’d acquired there each time I passed by. From the child buying a movie ticket for whatever was playing, or watching for changeover cues from the projection booth set high in the dark recesses of an art-deco building I had grown to love. Yet, the rest of the year provided major pivots in my life that would fuel other changes, including re-locating to other parts of L.A. that guaranteed an unexpected result. Though it left an indelible impression by giving me a chance to work a unique and revered trade, sadly, I never set foot inside that grand old movie palace ever again. The melancholy I will be feeling today is completely your fault! Alright I’m just kidding, but seriously, I too, knew that being a projectionist was never going to be the profitable career choice, and one day had to walk away myself. I still look back on those days with a sincere fondness and miss feeling that I (in some microscopic way) contributed to making someones moving going experience better. I went back to my old stomping ground a few years ago and as I stood staring at what had become a fairly busy Best Buy location there was an indescribable feeling that came over me. My theater, my projector and my screen was gone forever. I miss it dearly. Thanks for this walk down memory lane, as I have enjoyed reminiscing about a lost time and place, and long live old movies houses. Ah, I didn’t know you were a former-projectionist, too. I am honored by your words, Paul. You give voice to the memory that does it proud. Sorry to hear the movie house you once worked is no longer there. Truly sad. Thank you for your kind comment and readership to this project, my friend. p.s., the ‘Outro’ will cover the H.P. Warner in her current status. This series should get Lammy consideration. Thank you very kindly, Dan. I appreciate it immensely. Yeah, and this was lower than what was paid for ‘real’ projectionists back in the day. I remember you told me about your father having worked as a projectionist. Yes, falling asleep and reordering a film would then to stand out ;-). Many thanks for your loyal readership, Ruth. Journey’s end???? Oh no! I’ll miss this series, as well! Thank you very much, Rachel. Like back then, it had to end sometime :-). Really enjoyed the series. You did a great job remembering details and stories that made following an interesting experience. I almost feel like I was with you for that year and a half, sitting in the balcony, spicing broken film, dealing with irate customers and living on free soda. It was a great ride. Very kind of you to say, Richard. If I could bring a partial of that time to bare, then it was worth the effort. Many thanks :-). This has been a great series Michael, really enjoyed reading them. Top work my friend. Thank you very much, Chris. I appreciate you giving it the time and for your wonderful comments. Great stuff, Michael. I’m bummed that this series is over, but they were always enjoyable reads. Thanks for sharing your memories with us. I’m glad this found an audience, Eric. Thank you so much for taking the ride down memory lane with me. Y’know, I didn’t start off to write something melancholy, but it did evolve into that, to my surprise. Thank you very much for your loyal readership to this series and this place I haunt, Fernando.